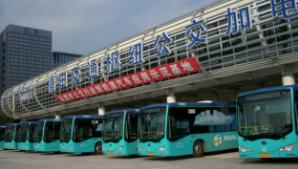 The city of Shenzen, China which currently utilizes 16,000 buses, more than the five largest North American bus fleets combined, has finished a six-year effort to replace its diesel-fueled buses and become the world’s first city to electrify its entire public transit bus fleet. Shenzen has methodically electrified its bus fleet in recent years to curb unhealthy air pollution and cut emissions. According to the United Nations’ Climate Action program, in 2015 there were 3,600 electric buses on the city’s roads. By 2016, the number increased to 9,000. By May 2017, the number reached 14,500. The remaining 1,500 buses will go emission-free before the end of the year. While coal remains as the main source of the buses’ power, the all-electric fleet will reduce carbon emissions by 48 percent and methane emissions by 100 percent, according to estimates cited by the Climate Action program. Shenzhen-based automobile manufacturer BYD (which stands for “build your dreams”) started the electric bus program in 2011 and has since delivered more than 80 percent of the new buses. China, the world’s biggest vehicle market, has emerged as a global leader in the supply and demand for electric vehicles. The Chinese government, faced with tackling serious pollution problems in many cities, is giving big subsidies to the country’s electric car manufacturers and is considering a ban on the production and sale of fossil fuel cars.